I was very fortunate to spend the past week in New York City. 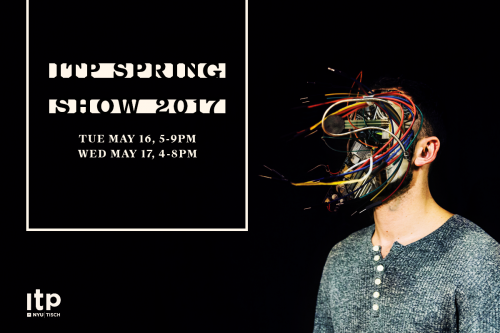 In addition to participating in Creative Tech Week, I also had the pleasure of visiting the ITP 2017 Spring Show. 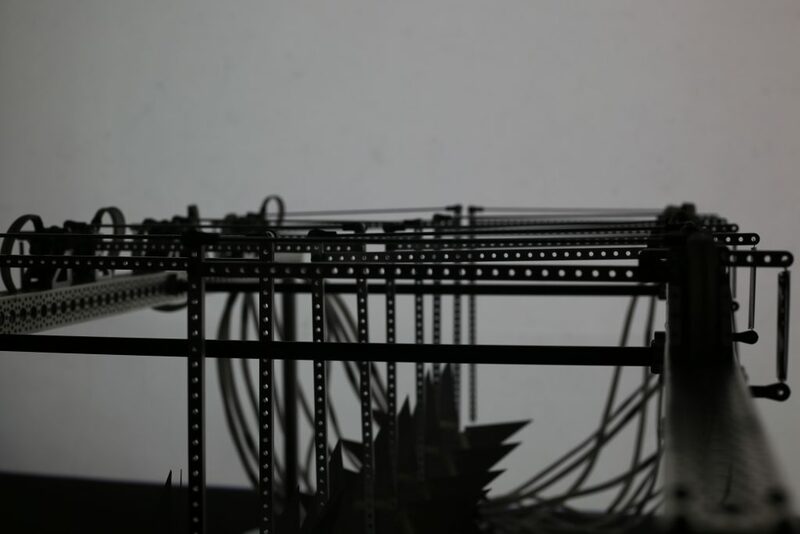 ITP, or the Interactive Telecommunications Program, is a two-year graduate program located in the Tisch School of the Arts at NYU. It also happens to be my alma mater! ITP's mission is to explore the imaginative use of technologies --- how they might augment, improve, and bring delight and art into people's lives. 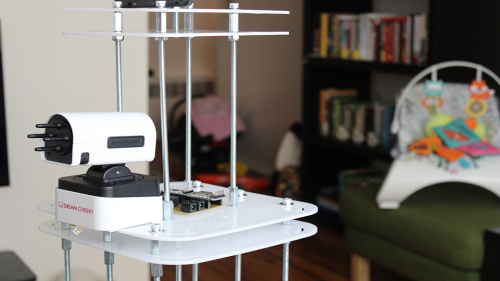 Students leverage engineering and technology for creative pursuits. At the end of each semester, ITP hosts a big showcase for the students to share their best work from the past four months with the public. It’s a major event with every inch of space covered in brilliant interactive projects and an overwhelming number of visitors coming to see the latest and greatest. 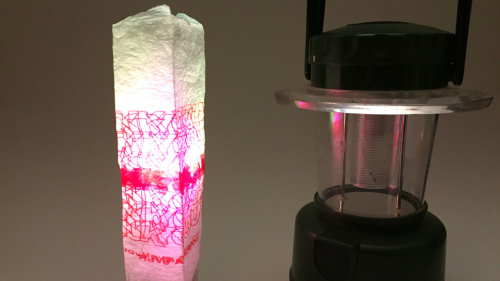 I was absolutely blown away at the ingenuity, creativity and technical brilliance evident in so many of the projects that I saw this year, and I’m extremely excited to share some of them with you today! K.W.E.E.N. is a line of wearable technology accessories for drag queens and other performers of femininity. The pieces that comprise K.W.E.E.N. confer upon the wearer performative superpowers, giving her unparalleled control over her appearance and the very spaces she commands. 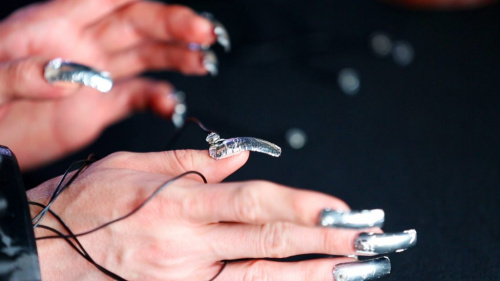 Like magic, lighting and staging elements change at the whim of the performer, thanks to her conductive nails. A LightBlue Bean hidden in a bracelet on each hand communicates wirelessly with Max/MSP, giving the wearer control over characteristics of the DMX universe: on/off, strobe, color, brightness, fog machine, laser, etc. Each finger trigger can be programmed to alter various aspects of lighting and staging, giving the performer the power to sculpt in real time the spaces graced by her presence. To learn more about K.W.E.E.N., check out this video of Jordan presenting his work, this video documenting the project, and the K.W.E.E.N. 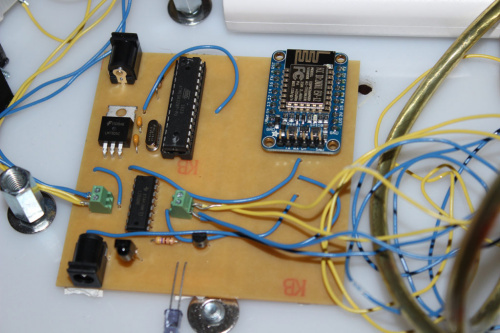 project page. 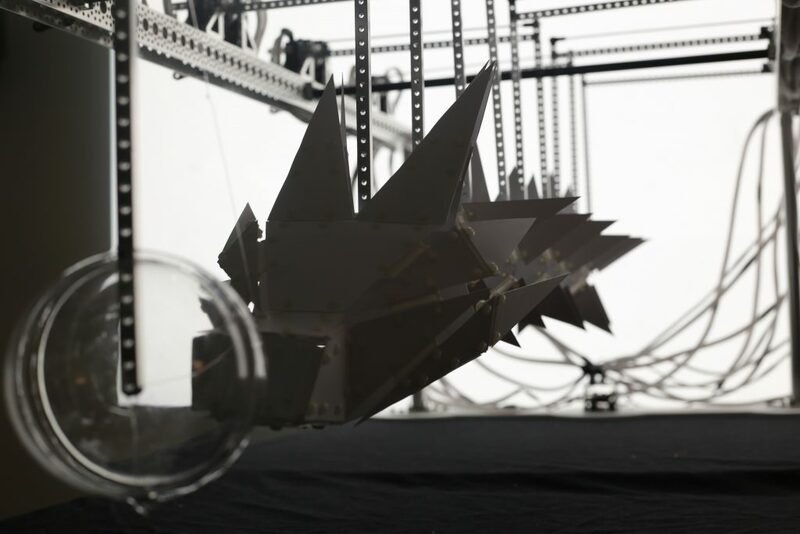 This project is an attempt to use technology to reinterpret the traditional dragon dance practice in the form of a kinetic sculpture. “A Ritual That Lasts Forever” is a metaphor in the form of a kinetic dragon sculpture, with allegorical power to tell the story of humanity’s relationship with traditional religious worship and technology, a story of the now and a prediction of the future. 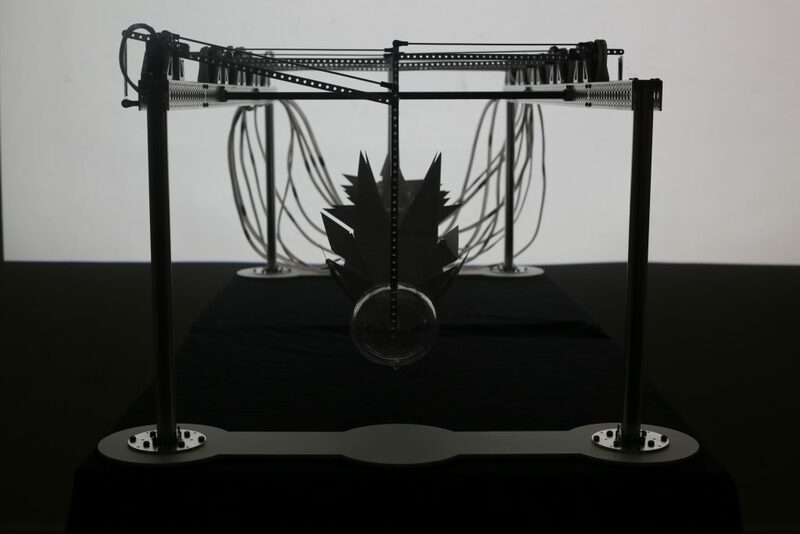 The piece features 11 robotic arms that control 10 segments of a long, acrylic dragon suspended below them, as well as a ball that the dragon is chasing. 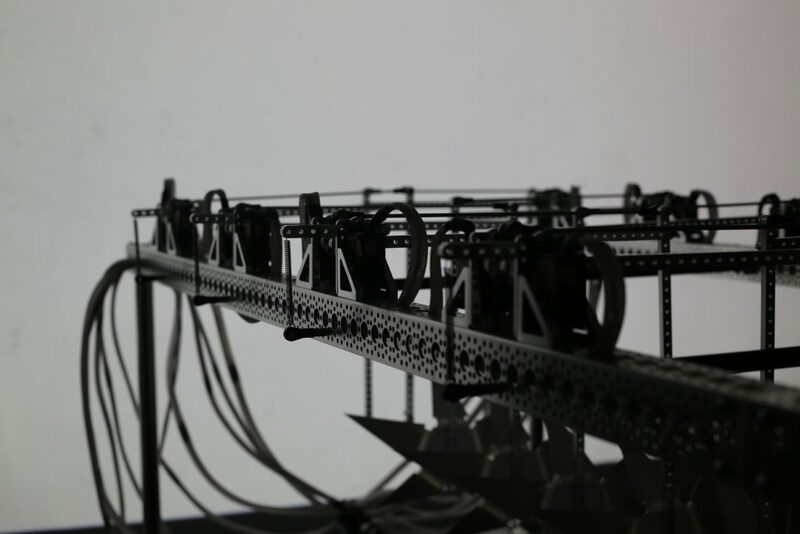 With a customized algorithm, the team of 11 robotic arms moves the dragon form suspended below to perform the dragon dance endlessly. In this way, the dragon is back again, aided by the very thing that has been taking the dragon away. To learn more about "A Ritual That Lasts Forever," check out this video of Franklin presenting his work, this video documenting the project, and the "A Ritual That Lasts Forever" project page. The "Museum of Funny Ladies --- A Museumette" is an interactive experience that brings to life a moment from the history of women in comedy, the 1970s, when pioneer lady comedy writers broke into an industry primarily dominated by men. 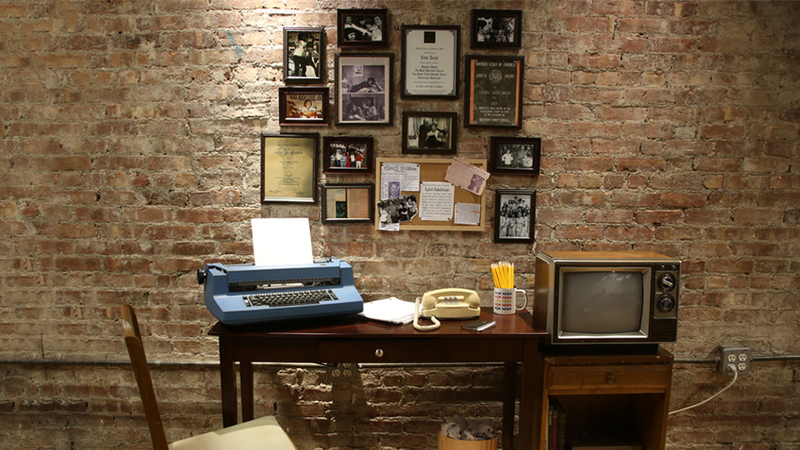 This exhibit transports visitors back to the 1970s and places them in the seat of pioneer TV comedy writer Sybil Adelman, a trailblazer who helped change the landscape of writers' rooms forever. 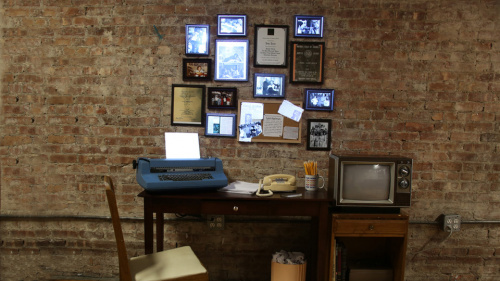 From a typewriter to scripts, a telephone to a television, visitors can interact with objects in the space that were part of a writer’s daily routine and experience what it was like to be the only woman in the room, through the eyes of Sybil. This experience features three entry points and an interactive story arc that matches the writing process from start to airtime. The experience begins at the typewriter, the global interaction, where one magic touch of a key brings the scene to life with her narrative of how she became a writer. Visitors can call a variety of important names and contacts in her address book to hear anecdotes about her experiences with them. After learning about the key people and stories behind the scenes, the television offers visitors the chance to change channels to see her work and effort come to fruition. To learn more about "Museum of Funny Ladies --- A Museumette," check out this video of Angela presenting her work, this video documenting the project, and the "Museum of Funny Ladies --- A Museumette" project page. 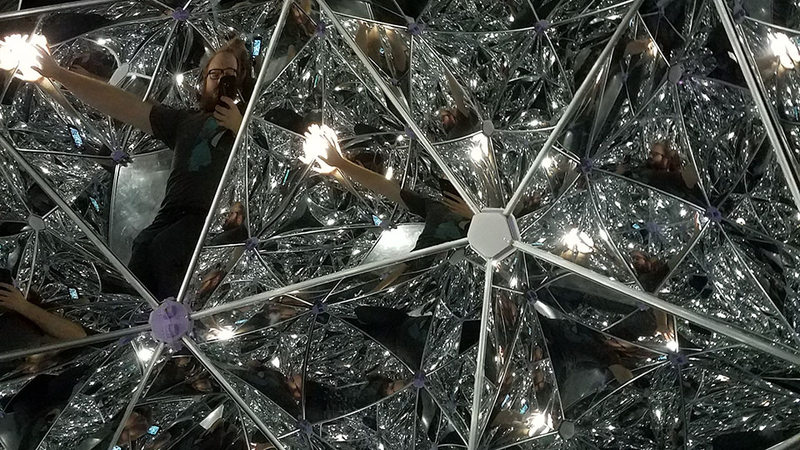 Geode #1 is a space for solitary contemplation of the body and the self --- in the form of an inside-out disco ball. 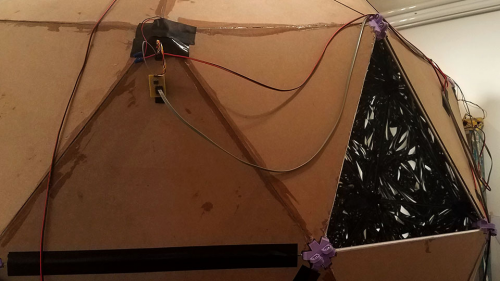 This geodesic sphere is 7 feet in diameter, mounted on a short wooden platform, with a small door in the side. The viewer enters the structure and sits down on a cushion on the floor, the door shuts, and everything is completely dark. After a short time, there is a flash of light, and all surfaces inside are revealed as mirrors. 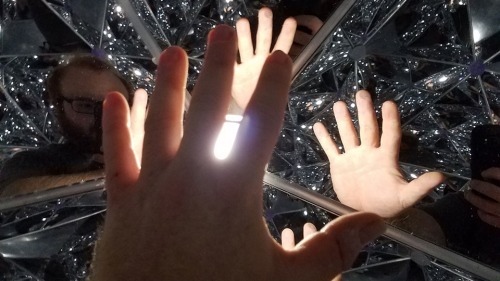 There is no fixed point, except for the viewer’s own body. Soon the lighting begins to change, both of its own accord and in response to the viewer's position and movements. The experience is by turns exploratory and meditative. 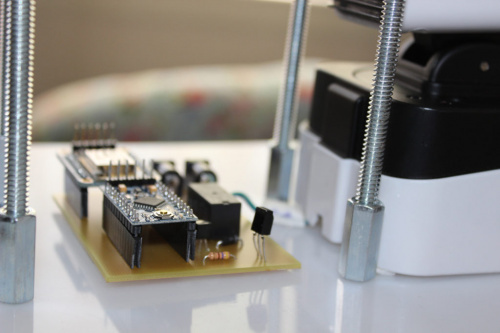 It is embedded with sensors with which the user can interact in the space. Lights turn on and off based on the user's actions. 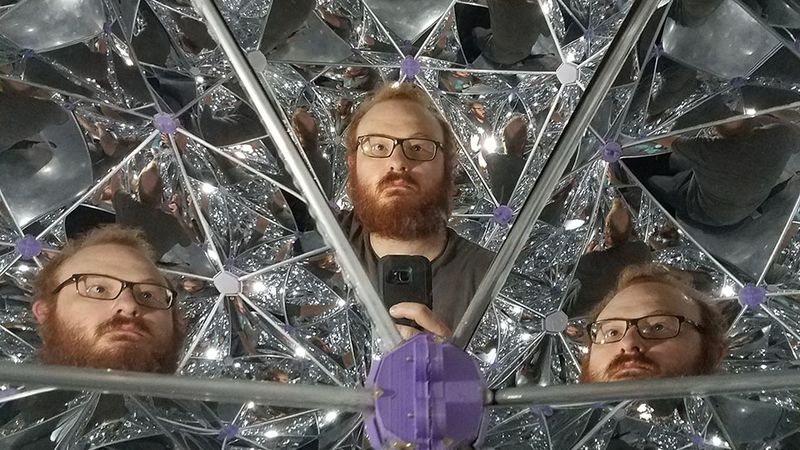 To learn more about Geode #1 (Fun House), check out this video of Jared presenting his work, and the Geode #1 (Fun House) project page. 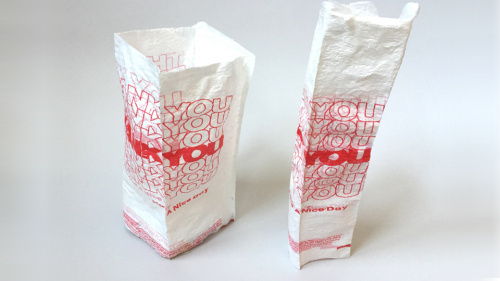 In this project, Aaron asks if something high-tech can be powered by trash. 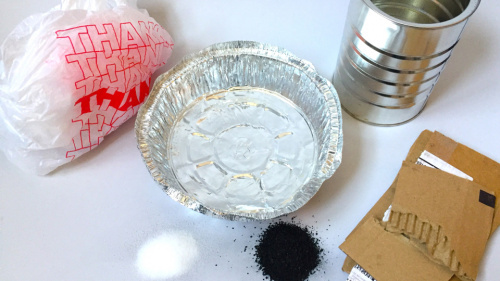 He successfully created a rechargeable battery using charcoal, steel and aluminum. 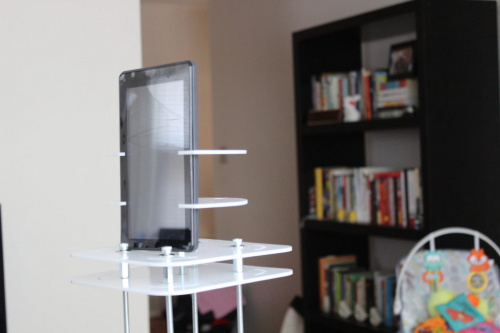 This final version of the battery uses a standard USB charger for recharging. 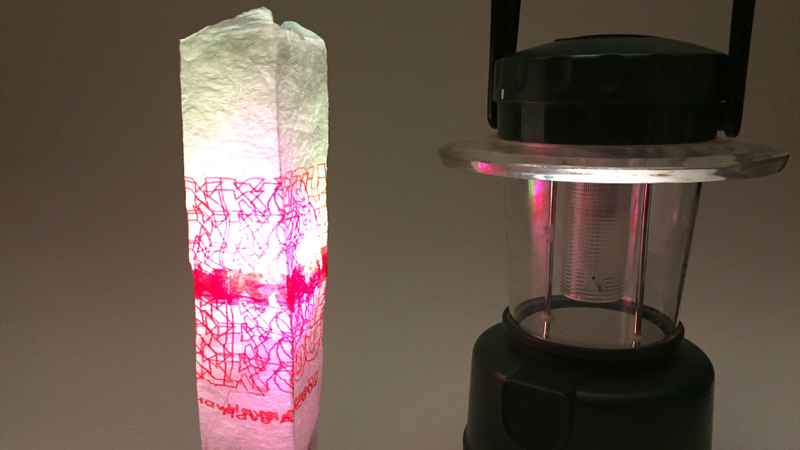 By charging three cells for 10 minutes with a USB charger, the battery will provide power to a 60 lumen LED for 10 hours. 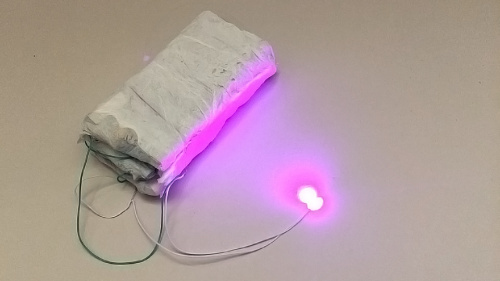 This final battery is made up of an aluminum electrode sandwiched between cardboard soaked in saltwater and charcoal and surrounded by a steel can. The battery cells are insulated from each other using fused plastic bags. To learn more about Thank You Lights, check out this video of Aaron presenting his work, and the Thank You Lights project page. For children with disabilities in medical facilities, the internet offers a connection to the lives of parents, siblings and friends. Though their bodies might not be able to inhabit the same place, they can still play through the networks that connect people with a wider world. Play:Connected features an internet-controlled rover streaming video and audio to a child in a remote medical facility. Built from various microcontrollers, motors and electronic components, the rover senses and responds to play with other children. In its current iteration, the rover engages other children via a foam-dart turret mounted on the device that can be activated by the child remotely. Others can retaliate via a sensor embedded in another foam-dart gun. When fired at the rover, the sensor activates a turret in the remote child’s room, discharging foam darts at him or her. To learn more about Play:Connected, check out this video of Jason presenting his work, this video documenting the project, and the Play:Connected project page. These six projects are just a taste of the incredible work that I witnessed last week. I wish I could share them all. To check out all of the 2017 ITP Thesis projects, visit the ITP Thesis 2017 page and browse around. You can also learn more about the projects that were featured in the ITP 2017 spring show on the Spring Show webpage! 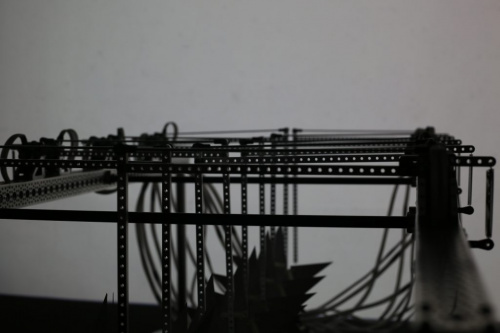 Congratulations to the students at ITP on a spectacular set of work! I can’t wait to see what the next year will bring!